Each year World AIDS Day is held on 1 December to raise awareness of the AIDS pandemic. In 2011 Sir Elton John delivered a keynote speech at one of two major events held in Sydney against the backdrop of the iconic Sydney Opera House sails featuring projections designed by Cindi Drennan. In 2012 events were held in Sydney and Melbourne, a new photographic case study by leading Magnum photographers was added to the Access To Life exhibition by The Global Fund. The unveiling took place at the Powerhouse Museum in Sydney. Simultaneously the Sydney Opera House, Parliament House in Canberra and the iconic spire of The Arts Centre in Melbourne, were all illuminated red. 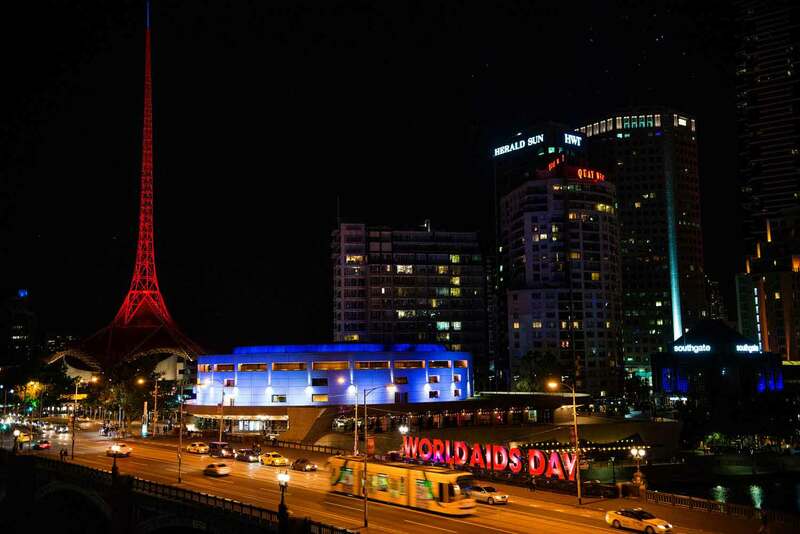 2013 the WORLD AIDS DAY red letters stood on Princess Bridge, community organisations gathered in Federation Square in a display of red. A reception and launch event for AIDS 2014 conference occurred at Government House with the inaugural visit to Australia by Daw Aung San Suu Kyi and Michel Sidibé the Excecutive Director of UNAIDS. Parliament House in Canberra hosted the 2014 and 2015 World AIDS Day events with a panel discussion moderated by Fran Kelly, the film screening of “Transmission: The Journey from HIV to AIDS” and the unfurling of the World AIDS Day banner on the Parliamentary Parade Ground. Cre8ion works closely with Pacific Friends of the Global Fund each year to envision and deliver these events.